San Miguel Especial is a premium pilsner style lager, golden in colour, sparkling with a generous white creamy head and citrus aroma. 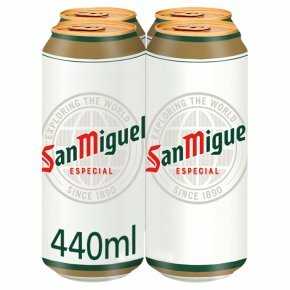 San Miguel perfectly balances bitterness to deliver full bodied beer with a clean, crisp and refreshing taste. San Miguel Especial has flavours of white bread, fruit, white flowers and liquorice. The beer has a subtle finish of roasted cereal and a pleasant balance between the sweetness of yeast and the mild bitterness of hops. Serve chilled, in the bottle or poured into a San Miguel chalice, of which the unique shape is designed to create and maintain a perfect head as well as channel the distinct aroma for a richer drinking experience, allowing you to enjoy the famous taste of San Miguel at its best. Should ideally be enjoyed at 6-8°C. San Miguel Especial is well suited to various cuisines from around the world, including spicy food, tapas style food, cured meats, hams and cheeses. GMO free. No added preservatives. Vegetarian. Vegan. San Miguel Especial is a premium pilsner style lager, golden in colour, sparkling with a generous white creamy head and citrus aroma. San Miguel perfectly balances bitterness to deliver full bodied beer with a clean, crisp and refreshing taste. Brewed and canned in the E.U.